James Glover of Interact, and Angela Holland. A fast-growing industrial recruitment agency has moved into a new and bigger base in the Black Country, in a deal sealed by Bulleys. The leading commercial property specialist has attracted Interact Recruitment Solutions Ltd to take an office on the Coneygre Industrial Estate, off Birmingham New Road in Tipton. Interact, which specialises in supplying labour on a temporary or permanent basis for the industrial sector, is moving from its previous base in Dudley as its workforce look set to double due to its expansion. Angela Holland, agency assistant in Bulleys’ Oldbury office, said: “We’re really pleased to have found the right place for Interact’s expansion. Bulleys markets and looks after the Coneygre Industrial Estate on behalf of landlord Thomas Dudley Group (Developments Division). 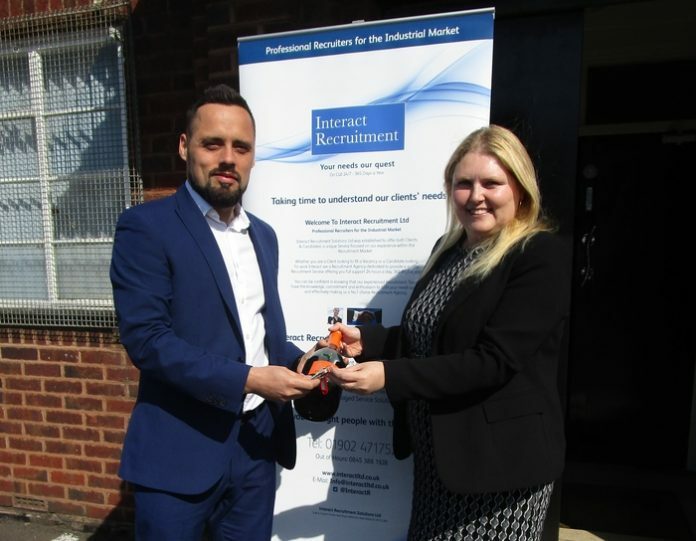 Dawn Clough, operations director at Interact Recruitment Solutions, said: “We’ve seen plenty of new business in recent months with our industrial clients increasingly wanting us to find both temporary and permanent staff for their changing requirements. Ms Clough added that Angela Holland at Bulleys was very helpful, assisting with a smooth and swift completion, and highly recommended Bulleys for its “impeccable service” and for “always going the extra mile for you”.